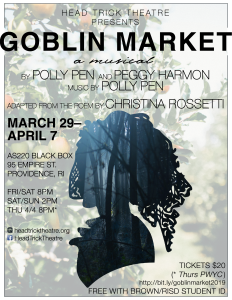 Browse: Home / Get your tickets to Goblin Market! Don’t miss the last weekend of Head Trick Theatre’s Goblin Market! Two adult sisters return to their childhood home, where they once again come face to face with the perils and fantasies of their youth. In Polly Pen and Peggy Harmon’s haunting chamber musical, adapted from Christina Rossetti’s poem, the wilder Laura chafes against the limits of her ordinary life, and succumbs to the lure of the goblin fruits and the mysterious world they promise. It’s up to cautious Lizzie to face down the goblins, and save herself and her sister from their darkest selves.